On August 24, 1349, 6,000 Jews were massacred in Mainz, Germany by being burned alive. Blamed for so many ills, this time they were held responsible for spreading the bubonic plague. History and Headlines Fact: Mainz is the birthplace of the Gutenberg moveable type printing press. On this same date in 1391, at least 300 Jews were murdered in Palma on the Balearic island of Majorca (Mallorca). All across Spain Jews were being massacred, and their only hope for survival would be to readily agree to being baptized in the Christian faith and to convert to Christianity. Previously, Crusaders had traveled through Spain on their way to the Holy Land and had terrorized, robbed and murdered Spanish Jews and had pillaged their communities on their journey. Later, Spain became the epicenter for the Inquisition, often referred to as “The Spanish Inquisition,” a Catholic program ordered by Rome to identify and burn heretics. History and Headlines Fact: Spanish Jews fled to Muslim-controlled cities and countries in order to escape persecution during the Inquisition! On August 23-24, 1929, enraged over reports which later proved false that Jews were taking over Muslim holy places, Arabs rioted and murdered 23 Jewish college students and 44 other Jews in Hebron, Palestine. Of the 435 surviving Jews, many owed their lives to Muslim families who had protected them. Meanwhile, other riots which cost the lives of 133 Jews and 110 Arabs were also taking place in Palestine. The Hebron riots resulted in Jews totally abandoning the city after having lived there for hundreds of years. 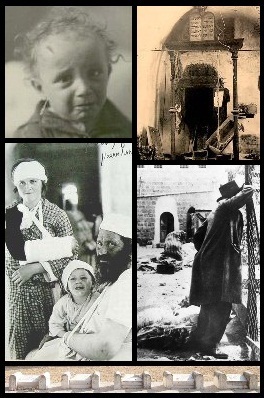 From top-left, clockwise: Shlomo, son of Eliezer Dan Slonim Dwek, aged 1, survives with wounds to his hand, wrist and forehead; The Holy Ark of the Sephardi Synagogue of Abraham is ransacked; A survivor reflecting in the aftermath of the slaughter; Family Kolstein recover from their injuries. Bottom: Memorials to murdered rabbinical students in the old Jewish cemetery. Today it is fashionable to downplay or even deny the extent of the World War II Holocaust in which 6 million Jews are claimed to have been murdered, however, the countless verifiable massacres of Jews and plunderings of their communities in dozens of countries throughout history justify the Jewish desire to have a country of their own for their own protection. This need is further confirmed by the actions of ISIS (Sunni Muslim fundamentalists), as they march across Iraq today, massacring any Iraqi Jews they find along the way (as well as Christians or anyone who disagrees with them). Whether you agree with Jewish nationalists or not, the evidence that they present in support of their own country Israel’s right to exist is certainly substantial. Questions for students: Could Jews live forever safely in countries like the U.S. or Canada? It might seem so, but history shows that sooner or later every place that Jews have lived becomes dangerous for them. What do you think? Do Jews in today’s world need a homeland? If so, where should it be? If not, why not? Feel free to join in on the discussion. Location of Israel. Map by Addicted04. Dershowitz, Alan. The Case for Israel. Wiley, 2003.